This example continues on from the Example: Connect Through Manifold ODBC to a Third Party example topic. Please read that topic first. In the Example: Connect Through Manifold ODBC to a Third Party example, we showed how with Release 8, we could use an ODBC connection to a Manifold .map to connect through the .map project to a third party, external data source, an ESRI GDB file geodatabase. We used Manifold facilities as an intermediary to give Release 8 capabilities it does not have on its own, to link into data stored within an ESRI file geodatabase. The ESRI GDB file database used is the same one created as a Manifold data source in the Example: Connect to an ESRI GDB File Geodatabase topic. We can do the same with any other reasonably ODBC-capable application. In this example we use LibreOffice Base, the open source LibreOffice competitor to Microsoft Access, to connect to an ESRI GDB file database through Manifold. 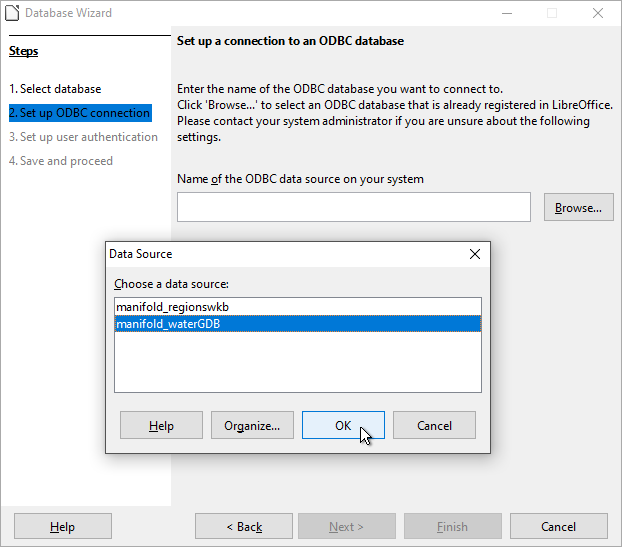 We use the same water_distribution ODBC data Source utilized in the Example: Connect Through Manifold ODBC to a Third Party example. Launch LibreOffice Base. We will be using Version: 6.0.5 (x64). 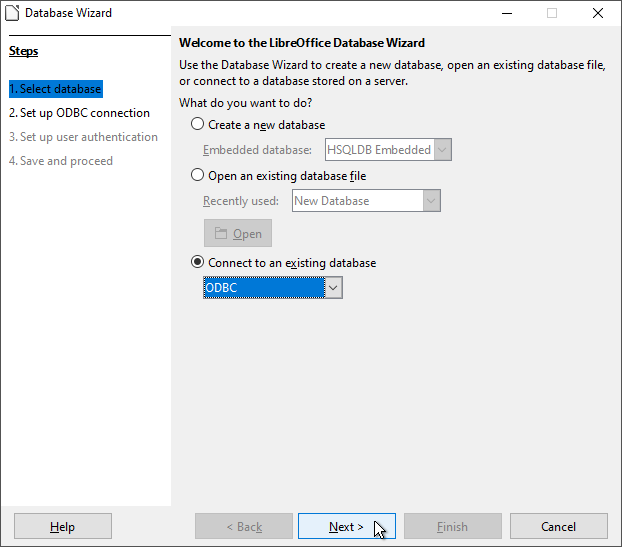 In the first step of the new database wizard, we click on Connect to an existing database and choose ODBC. Press Next. 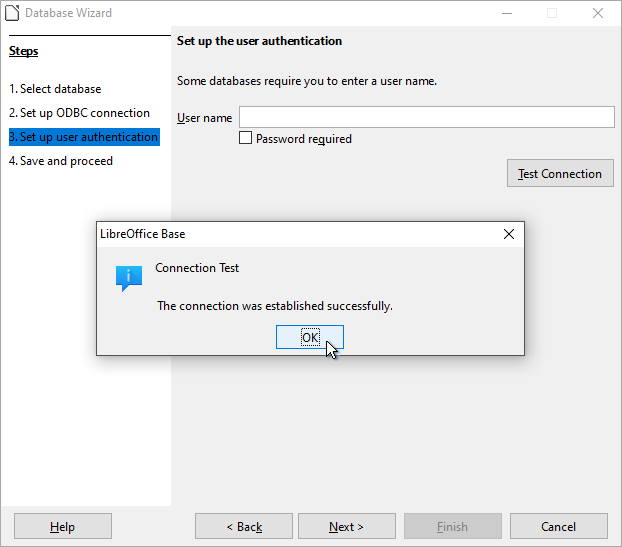 Clicking the Browse button in the resulting pop-up dialog we choose the water_distribution ODBC data source that was created in the Example: Create an ODBC Data Source with Windows topic. Press OK and then press Next. No password is required so we leave that blank. We press Test Connection and when the test is successful we press OK and then Next. This is just an example, so we won't bother registering the data source as a database in LibreOffice. We press Finish. LibreOffice opens a Save As dialog. We choose a name for this new database, New Database.odb and press Save. It then opens in LibreOffice Base. 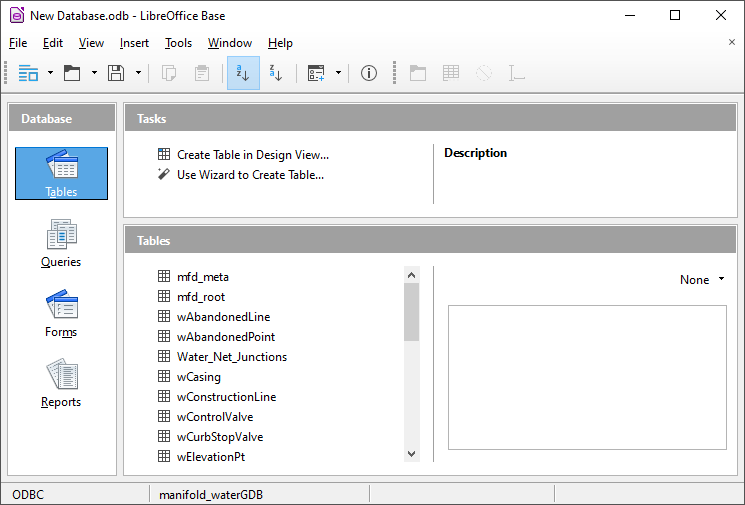 LibreOffice Base provides a highly appealing and clean view of the tables within the data source. 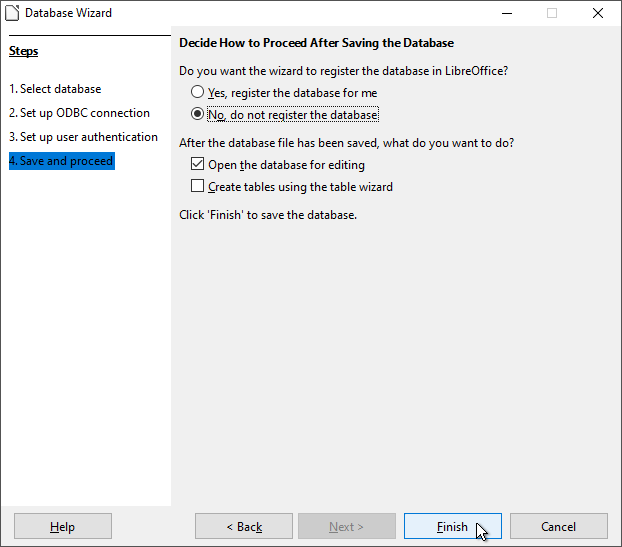 We are using LibreOffice to connect through Manifold with ODBC to look into tables that are stored within an ESRI GDB file geodatabase. If we click open the wHydrant table we can see it is the same table that we previously viewed in Release 8. As with Release 8, we have a "live" connection through Manifold into the table within the ESRI file geodatabase. We can edit the table with LibreOffice Base, just as if it were a local table within LibreOffice. The Manifold connection is fully read/write. Example: Convert an ESRI File Geodatabase into a .map Project - How to convert data in ESRI's current file geodatabase format into a Manifold .map project in a single step. We convert ESRI's example NapervilleGas GDB geodatabase, all 857 files, into a single, unified Manifold .map project.